The main objective of this research area is the arm control and planning of the LWR-UC3M-1, robotic arm of MANFRED-2. Kinematic chain similar to the human one. Total weight of 18 kilograms. Maximum load capability of 4.5 kilograms at the end effector. Maximum distance reached around 955 millimeters. Cartesian control based on the analytical Jacobian matrix, which gives us the relationship between the cartesian velocities at the end effector and the required velocities in the articulations in order to execute the required trajectory. 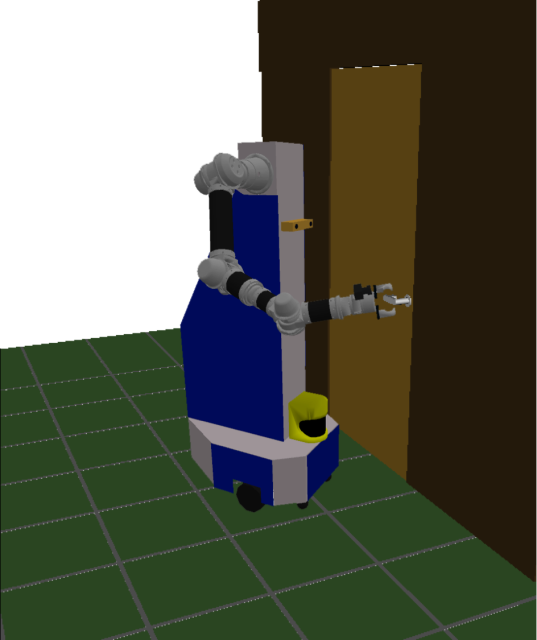 This control scheme is based on the one proposed by Sciavicco y Siciliano in “Modelling and control of robot manipulators”, 2005. Cartesian control based on the the calculation of the inverse kinematics of the manipulator using evolutionary algorithms. In this case, the Differential Evolution algorithm is used to calculate the motors positions that allow the end effector to reach the desired cartesian point in the space.